High-tech circus meets grand opera. That's a quick way to sum up the Metropolitan Opera's production of Hector Berlioz's masterpiece, "La Damnation de Faust," which opened Friday at Lincoln Center. It took computers and motion-sensitive cameras to create the pulsating water, fire, sky and grass that are the cinematic backdrop for the drama. Even digitally generated birds cross the heavens in response to the tenor's fluctuating voice, triggered by a transmitter attached to the singer. The spectacle was directed by Robert Lepage, creator of a Cirque du Soleil show in Las Vegas, who brought both art and athleticism to the Met stage with what he calls his high-tech "toys" -- the latest in motion and sound technology. 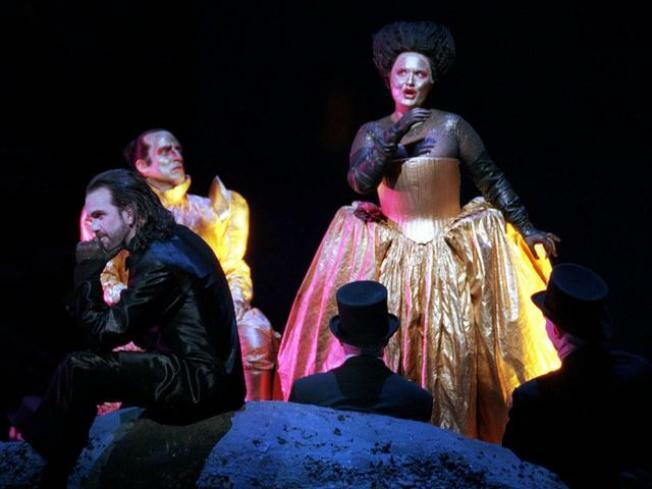 The production features an all-star cast: tenor Marcello Giordani in the title role of the lonely, aging scholar Faust; mezzo-soprano Susan Graham as Marguerite, the object of the fleeting sexual ecstasy that destroys him; and bass-baritone John Relyea as Mephistopheles, who has a devil of a good time engineering the debacle. Based on Goethe's "Faust," the Berlioz work was premiered in Paris in 1846 and first staged by the Met in 1906 -- and never again till now. The composer called it a "legende dramatique." It was, indeed, a dramatic evening -- a lavishly modern, multimillion-dollar production wrapped around a taut, technically polished reading of the score. As Marguerite, Graham has the ideal voice for Berlioz -- a mezzo with a dark richness that blossoms into lush soprano-like tones -- and she's a perfect instrument for the devil's seduction of Faust's pure soul. Graham joined Giordani for a magnificent rendition of "Ange adore" (meaning "adored angel") -- a love duet combining her radiant tones with his ascensions to sweet, high notes for a sublime blend of voices. The tenor has vastly expanded his acting and vocal palette in recent years. At 45, Giordano exuded both Faust's terror and tenderness as he transforms the desperate, solitary scholar into an overwrought lover and, finally, a broken man seeking solace in his immense hymn to nature, which Giordano sang with noble, heartfelt intensity. Relyea as Mephistopheles was masterful, tossing off the devil's cunning with virtuosic bravura and a chocolaty tone -- a serpent-like figure in red leather reeling in his unsuspecting prey, Faust. James Levine conducted with ease and brilliance, though he could have led the orchestra with greater ferocity in certain climactic moments. The horns and winds were powerful and precise, and the strings exuded a velvety sheen, switching to Berlioz's sardonic passages with bite and grit. But the overarching star of the evening was undoubtedly the Met chorus. With stupendous outbursts of vocal intensity, the choristers drove the drama from a raucous mock-fugue in Latin to demons singing triumphantly of the "mystery of horror" to the hushed, heavenly voices at the end, capped by singing children dressed in white. The chorus brought an incandescent spiritual power to the production -- in contrast with the muscular athleticism of figures climbing the sets like high-wire circus performers. The Met stage was dominated by a scaffold divided into two dozen panels -- a framework for projections changing with each scene. At one point, the ladder that serves to mount Faust's scholarly bookshelves becomes part of a crucifixion, with a Christ-like human figure suspended from it. Lepage and his Quebec-based company, Ex Machina, used similar technology for KA, his multimedia work for Cirque du Soleil in Las Vegas four years ago. "La Damnation de Faust" is to be transmitted worldwide in movie theaters as part of "The Met: Live in HD" series on Nov. 22 at 1 p.m. EST.